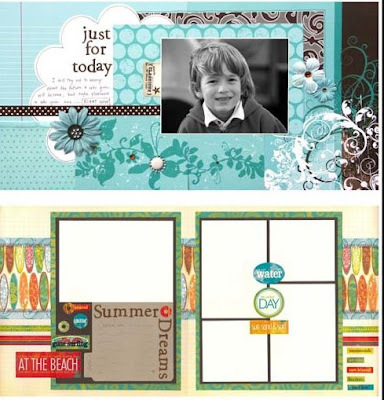 The June "Amber's Possibilities" kit club features two fun layouts. I guess I'm tired of winter and COLD because everything I used has hibiscus flowers and bright colors. Isn't this GORGEOUS? As you can see, I believe that boy pages can be made using swirls, flowers and bling and still be masculine. I've designed my page with a 6 x 8 photo, but this layout will perfectly fit two 4 x 6 photos! Summer Dreams: As you can tell, I've had "summer dreams". This is the perfect layout to get you out of the cold blahs just add five photos that remind you of summer and you're done!